45 mm by 14 mm thick 18K white gold case, sapphire back, beaded crown set with sapphire cabochon, sapphire crystal, slate dial with silvered open-work grid and Roman numerals with blued hands, caliber 9908 MC automatic movement with annual calendar complication, days and months indicated by a hand, large date at 12 o'clock, brown alligator strap with 18K pink gold buckle, buckle double deployant. Water resistant to 30 meters. 45 mm by 14 mm thick 18K white gold case, sapphire back, beaded crown set with sapphire cabochon, sapphire crystal, slate dial with silvered open-work grid and Roman numerals with blued hands, caliber 9908 MC automatic movement with annual calendar complication, days and months indicated by a hand, large date at 12 o'clock, black alligator strap with 18K white gold buckle, buckle double deployant. Water resistant to 30 meters. 40mm 18K pink gold case, 13.26mm thick, sapphire back, beaded 18K pink gold crown set with a blue sapphire cabochon, 18K pink gold bezel, sapphire crystal, grey dial, caliber 9908 self-winding movement with blued-steel sword-shaped hands, hammer-shaped hand with a red tip. 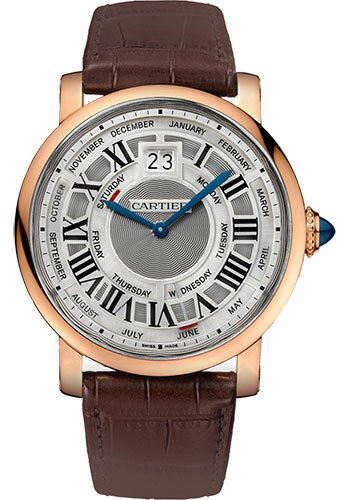 annual calendar complication with days indicated by a hammer-shaped hand and months by a disc, large date at 12 o'clock, approximately 48 hours of power reserve, brown alligator skin strap, double adjustable folding buckle. Water resistant to 3 bar. 40mm 18K white gold case, 13.26mm thick, 18K white gold crown set with a blue sapphire, sapphire crystal, grey dial with blued steel-sword shaped hands, self-winding movement annual calendar complication with days indicated by a hammer-shaped hand and months by a disc, large date at 12 o'clock, approximately 48 hours of power reserve, black alligator skin strap, 18K white gold buckle with double adjustable folding. Water resistant to 30 meters.